The Patients are monitored throughout their lives by the Doctors; each Patient carries a coded health passport, and faces incessant medical monitoring. Those judged to be ill threaten the sacred goal of Public Health, and will either be ‘modified’, or if incurable, painlessly ‘thanatized’. And in this brave new world — Huxley’s famous novel is clearly an inspiration, along with Orwell’s 1984 — illness includes ageing (the over-60s are in constant danger of thanatization), pregnancy without eugenic sanction, and political dissent itself. Caduceus Wild is not a masterwork of science fiction, let alone of the Anglophone literary canon. Its cover, though as inaccurate as any mass-market SF cover, conveys effectively the picaresque chase narrative that fills much of its action. One wonders, as well, how far its market viability as a novel was dependent on the success of the not-dissimilar 1976 movie, Logan’s Run (and the related 1977-78 TV mini-series). Moore’s novel doesn’t need sophisticated readerly empathy. A Martian might find it puzzling, but your everyday reader won’t. So it doesn’t fit a familar paradigm of literature and medicine — one in which books are there so doctors and medical students can expand their imaginative plasticity by sitting around, brows furrowed, empathizing furiously with imaginary sick people. 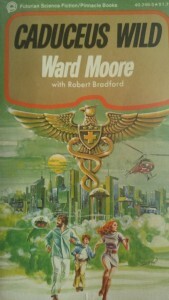 Caduceus Wild does though show how science fiction offers a different kind of literature to the medical humanities. To use the foundational ideas of the critic Darko Suvin, the Medarchy is a socio-political innovation (or socio-political ‘novum’) that extrapolates from tendencies in our own society, allowing us to articulate and reflect critically upon the taken-for-granted ideologies of our present (a readerly awakening that SF criticism calls ‘cognitive estrangement’). And, in its own way, this is an existentialist novel of ideas. The reader is privy at points to what are essentially Socratic dialogues on the value of a society without suffering (at least in any superficial sense), but also without significant freedoms — a device familar from utopian blueprints such as B.F. Skinner’s novel Walden Two (1948). There are more than a few flaws to Caduceus Wild, but this neglected popular text confronted a non-elite readership with ideas, provocations, and extrapolations that an academic audience would identify as resonant with the work of Foucault or Illich. For that reason alone, it’s going in our database of sources.